Last week my #studiofriday was actually Wednesday and Thursday at Interweave’s YarnFest. Since I live just down the road and I’ve always wanted to take a class from these particular teachers, this was the year. I didn’t have the time to teach this year, but I made the time to take two classes. Wednesday was Spinning Nordic Wools with Kate Larson. Kate is a spinner and shepherdess and the editor of Spin Off magazine. She is also a fantastic knitter, embroiderer, and I’d guess she has a few other talents up her sleeve as well. I have taught at the same conference as Kate a few times and always wished I was in her class. I was so glad I made the time to take this one and that there was one space left! Spinning is magic to me. Before I learned to spin I just bought the yarn I had been taught to use. I still use that yarn for my largest tapestries, but spinning has led me into a love affair with yarn. When you start to understand how yarn is made and to gain the skills to make the yarn you want yourself, the world opens up. There is nothing more satisfying than taking a lovely stinky fleece through all the steps to make and dye the yarn and weave it into a tapestry. It is magic. I love Kate’s knowledge of all things sheep. She has a knack for describing how wool acts and why. Some of this is because she raises her own Border Leicester sheep (watch her Instagram feed because I bet there are lambs any day!). But she is also very knowledgable about the sheep and fiber arts of Scandinavia, so this class about Nordic Wools was full of her wisdom. Thanks Kate! When I do take a workshop, I like to take notes. I leave space in the notebook to attach snapshots. I won’t remember when I get home what that raw fleece she unrolled on the ghastly bright orange hotel carpet was unless I write it down and a photo helps cement the information. I also take snapshots of process things. Kate was demonstrating how to separate the shorter and longer fibers, so I took a photo showing how she pulls out the longer fibers in an Icelandic fleece and then an example of the lengths I had in my lock on my leg. I carded all but the longest ones together and spun that and spun the longest, coarsest fibers separately. They’d be great for tapestry! My notes aren’t pretty, but they are a good reference for later. Click the images in the gallery below for larger versions with captions. Kate has a marvelous system of tracking her projects. I love the easy way she tracks both the spinning samples and source fibers (see the second two photos in the gallery above). 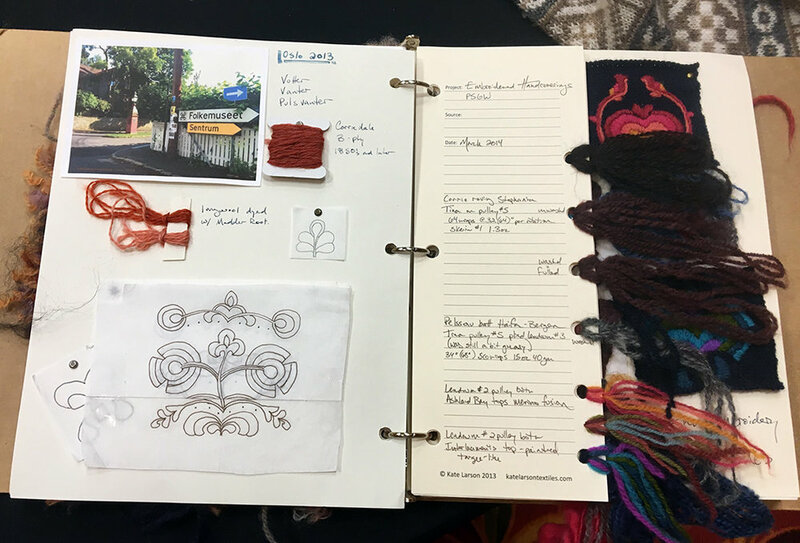 Her example notebook was full of small samples where she had used the yarns in knitting and embroidery also as well as yarn wraps and photographs from her travels. She sells the notebooks and pages in her online store HERE. If you’re interested in more information about this record keeping method and more photos of her notebooks, see THIS blog post of Kate’s. They’re quite magical. And right here is the reason that notebook I started in Kate’s class is paying off. I took this photo, printed it, pasted it into the notebook I was writing in and I labeled it “Gotland.” When I labeled it, I was 100% sure this was Gotland fleece… BUT now I’m second guessing myself. There were three different fleeces on that table that were gray and one was Pelssau which was my very favorite and there was some Pelssau top which was amazing… and suddenly I’m not sure if this photo is Gotland! Any bets? 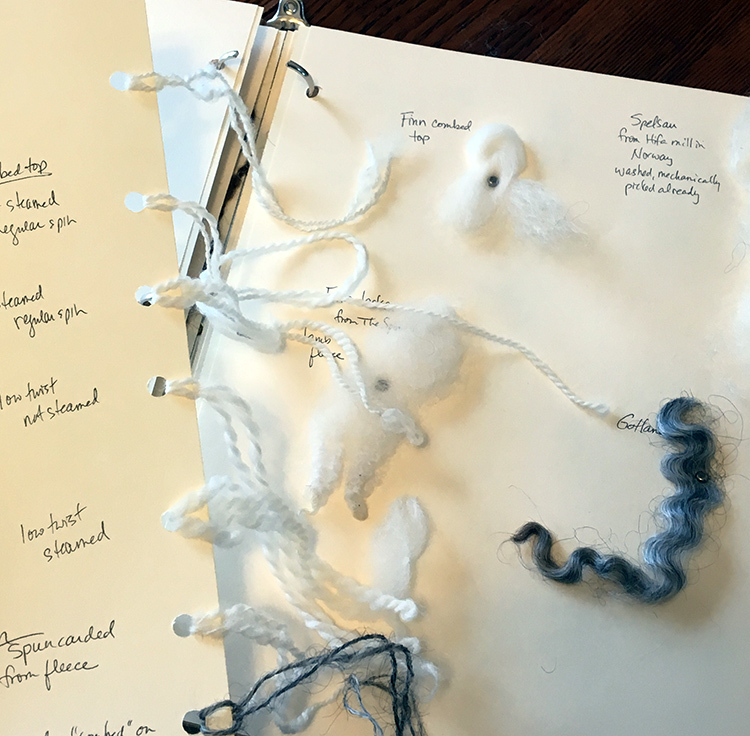 I found the fleece in my sample notebook—the fiber, not a photo. I am now about 99% sure it is Gotland. The Pelssau was also grey, but the crimp was different than this. I think the lock in my hand is Gotland but I’m holding it over the Pelssau fleece and carded batt in the photo. My one short day in Kate’s class was a wonderful respite from my own office and studio. I loved letting my mind float over other possibilities. I think these Nordic sheep breeds are perfect candidates for handspun tapestry yarn. Every one of them would work, though the coarser long fibers are probably the very best for tapestry. Some of these breeds produce wool of many colors and I’d like to collect a variety of natural colors to spin and weave with. Fortunately Kate gave us a few ideas of where to source fleeces, and if I’m feeling lazy, combed top. If you’re interested in sheep and want a glimpse of Scotland in 1932, take a look at THIS video which Kate referenced in the class. It is in the National Library of Scotland’s online archive. It is a 10 minute silent film that shows Shetland sheep being rounded up, the rooing process, spinning, and knitting the fleece. Some Shetland sheep still shed their fleece which is called rooing. * They don’t flock well and the beginning is pretty hilarious—people and dogs trying to round up those sheep. My favorite fiber was the Pelssau, a Norwegian longwool. I loved spinning it so much I didn’t even take a photo of it. I took another class at YarnFest on Thursday from John Mullarkey. I’ll tell you more about that later this week! *Almost no sheep today roo. I’ve seen a lot of misinformation in advertising about wool lately. Companies that use synthetic fibers are trying to convince you that shearing sheep is bad for them. This is misinformation which damages the fiber industry. Sheep have to be shorn. They’ve been bred over thousands of years of domestication to need humans to remove that fleece. It is very unhealthy for them not to be shorn every 6 to 18 months depending on the breed. Wool is far healthier for our planet than synthetic fiber. Don’t believe those advertisers!